For statistic anoraks Geoffrey Lees holds a special place in the GP history books. In his five GP starts, he started them all in different chassis: Tyrrell, Shadow, Ensign, Theodore, Lotus. If you add his 7 DNQs then you have the complete Geoff Lees Formula One CV. Geoff was born in Atherstone in the British Midlands, just 10km from the Mallory Park race circuit. So it was not hard for the youngster to be influenced by motor racing. Naturally he got bitten by the motorsport bug. That fact did not help him in school and he lated admitted to spending more time at the track than he did at school. Already when he was 15 he decided that his school days were over. He became an apprentice mechanic for a local garage. He saved all his money until he was able to purchase his first motorcar - a Lotus 23B. About that time he also met Graham Hill at his local circuit Mallory Park, when Hill was there testing a Jaguar E-type. He felt lucky to be able to exchange a few words with him and this changed Lees' life forever. He debuted in Formula Fords in 1971 at age 20. He pedalled the Alexis car with enough flair and showed enough talent to finish fourth in the championship. He finished the year with an emotional first win at his home track of Mallory Park. For 1972 he raced only at Silverstone to keep costs down. He was struggling to find sponsorship and he had to sit out the following year. He saved all his money and bought a Royale RP16 for 1974 and Geoff was back on track. He continued in Formula Fords and he ended the year as runner-up in the final results. 1975 was the year for Geoff. In a works-supported Royale RP21 with a Minister-tweaked Kent 1600cc engine, he became the first one ever to win all the three different championships in a year. From 40 starts he scored 32 wins and on top of that he also won the Formula Ford Festival. Now was the time to move on to bigger things. 1976-'77 were spent in a Chevron for lesser teams but still he finished 3rd overall in 1976 in both the Shell Sport championship and the BP championship and was 4th overall in 1977. Already next year Geoff took the plunge and jumped into the deep end. Now he was a Formula One driver! True, it was in a secondary series called Aurora F1, but nevertheless… three wins took him on the way to 6th overall in the series, while he also drove a works Chevron in Formula Three. At the same time he made an attempt to qualify for the British GP in an Ensign. Proving his versatility, he also drove a Chevron B42-Hart for Jack Kallay in the European F2 championship. A fourth at Misano was his best result. 1979 was the first year Geoff could call himself a professional driver. Now he got paid to do what he enjoyed the most. His new job was to drive a Lola T333CS for Count Van der Straaten's VDS team in the North American CanAm Championship. Geoff eventually finished 3rd overall. Geoff really enjoyed the CanAm series, but all the commuting over the Atlantic took its toll and he admitted that he was unable to do a proper job due to the fact that he had to constantly adjust to time zones. His real F1 debut came for Tyrrell at Hockenheim when he subbed for an ill Jean-Pierre Jarier. After another long-distance flight home from the States he got a call from his manager Peter Gethin who said: "Don't unpack your bags, get yourself a ticket to Germany! You are driving the Tyrrell tomorrow!" Geoff clearly felt Gethin was trying to pull off a practical joke and he hang up. Five minutes later Gethin called again to explain that Jarier was unwell and Lees indeed had the seat for the weekend. After arriving on the scene at Hockenheim, Geoff tried the car for size and found out that it was perfect for him, they didn't even have to make him a seat! Before qualifying Ken Tyrrell had told him not be disappointed if he didn't qualify for the race, but he eventually put the car 13th on the grid only two spots behind Didier Pironi. He liked the car and enjoyed the experience and finished just outside the points. In November Geoff won the traditional Macau race held on the peculiar track through the narrow winding hilly streets and the ultra-fast and wide portion down by the harbour. He drove a Formula Pacific Ralt RT1. Early in 1980 Geoff was talked into having another go at Formula One. Stefan Johansson had left the troubled Shadow team after the two first races. With hindsight Geoff would never had taken the job. In his own words: "It was the worst car I ever drove in my life. It is the only car that has ever frightened me." Geoff, by now in the equally miserable follow-up DN12, was put out of his misery after the French GP as the receivers came to the garage and collected everything. The once proud Shadow team was now sent into the history books. At Zandvoort Geoff was offered an Ensign ride. He accepted but found the car only slightly better than the previous one. "You put the anti-roll bar on full soft or full hard, it didn't make any difference...." He actually managed to put the car on the grid and bumped local-hero Jan Lammers off the grid in the process. A ride in a better car came late in the season at Watkins Glen. He drove the RAM Williams FW07 but he was suffering from 'flu and was unable to perform at the usual level. The life in underfinanced teams and driving poor cars was no longer appealing to Geoff. He had been there and done that. Now he decided to move on to something else and he took a step down from Formula One to Formula Two to once again be paid for his efforts. For 1980 Honda was back in motorsports and together with veteran designer Ron Tauranac they had entered a V6-powered Ralt RH6. For the season finale at Hockenheim Geoff was given a second works Ralt-Honda and nearly won the race. Only a flat tyre a few laps from the end, put an end to that. He was also back at the Macau GP late in 1980 and took his second straight win there. When Geoff was offered a full-time ride for Ralt-Honda in 1981 he didn't need time to think it over. Now he had the chance to drive for a top-notch team, and this was more appealing to him than driving for a backmarker GP team. Now he the had chance to shine and be able to do a 100% professional job. His team mate was the ultra-fast but somewhat enigmatic Kiwi Mike Thackwell. Early on in the season Thackwell shunted quite badly at Thruxton so the Ralt-Honda team now had to rely on Geoff. Geoff and the team had their fair share of problems during the early part of the season. The Honda engine was plagued by reliability problems and high fuel consumption. The V6 needed 45L/100km compared to the 30-35L/100km for the fourbangers. For a 200km race and a 100L fuelcell with a positioning lap or two, it made the car very marginal on fuel. A change from Bosch to Lucas fuel injection improved the situation but it cost some power. Lees also suffered from terrible headaches due to the very noisy V6 screamer. A redesigned airbox improved matters. They put one airbox for each cylinder bank instead of one single. Still Lees said it was the noisiest car he had ever driven. Hard work was needed and team principal Ron Tauranac put Geoff's testing skills to full use. Tauranac especially liked his consistent driving lap over lap. The 7th race of the season at Pau was the turning point of the season and his results from then on speak for itself. 1-retired-1-1-2-2 meant that he won the F2 Euro Championship on 51 points, 14 points ahead of Thierry Boutsen. The Championship win put Geoff in a difficult situation. The reason was that Geoff had hoped to graduate to Formula One with Honda but they would not be ready for F1 until 1983. 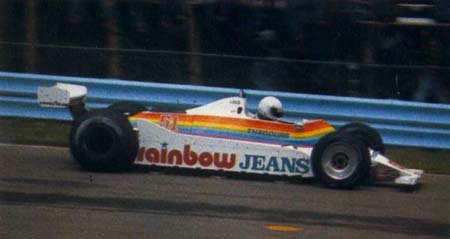 And his F2 championship win made him uneligible for the 1982 series. He managed the get a few jobs during the year. He drove a Nimrod at Le Mans and briefly returned to Formula One twice. First with the Theodore team, and then Nigel Mansell got injured in the Canadian GP. 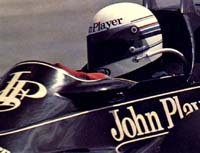 JPS Team Lotus replaced him with Roberto Moreno at Zandvoort and with Geoff Lees at Paul Ricard. This was to be his final GP. He did a good job in an understeering Lotus 91. He also sent two Cosworths to Saint Peter during the weekend. Still he finished in a decent 12th place. It would take another five years before Geoff was back in a Formula One car again. Unable to get a seat in Europe, Geoff now pioneered the European invasion to Japan. He spent most part of the next 10 years on the race tracks in Japan and enjoyed a successful career there. As the doyen of gai-jins (westerners) in Japan, Geoff guided many of the newcomers for many years in Japan. 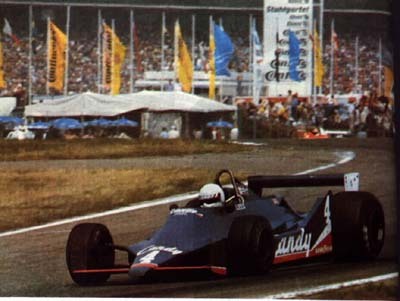 His Japanese career yielded the F2 crown in 1983 and the runner-up spot in 1984. He was in the category during 1983-'86. Geoff also won in the Grand Champion category for Can-Am style single-seater sportscars for four successive years during 1986-'89. He also raced Group C Toyotas for TOM'S in both Japan and the World Championship and was a stalwart of Le Mans for many years, with a 6th overall in a Toyota 90CV in 1990 his best score. He was still a winner at age 41 when he won at the Monza round of the Sportscar World Championship in 1992. He piloted a Toyota TS010 on that occasion. For the latter part of the 1990s Geoff shared his driving duties between the factory Lister Storm and McLaren F1 outings in GT racing. As late as 1998 Geoff was still winning races for GTC Competition by winning the Jarama and Monza GT rounds in a McLaren F1-GTR. He also shared one of the stunning Toyota GT-Ones at Le Mans. He came within hours of winning the race, but a gearbox problem ended his dream. At age 49, Geoff Lees was again entered for Le Mans in 2000, this time sharing a BMW V12 LM98 with car owner Thomas Bscher and Jean-Marc Gounon. The car lasted 180 laps before the gearbox cried enough. He shared the same car with Bscher at the Nürburgring in September 2000. After that race Lees decided that it was time to hang up his helmet and retire from the sport. He said: "I'm disappointed my Formula 1 career never took off, but I'm very happy I went to Japan for 10 years. I met my wife and made some money, and I feel very lucky to have done something I love for so long." A real class act! Think John Player Special Lotus and any number of great names come to mind, from Mario Andretti to Ronnie Peterson to Elio de Angelis to a young Nigel Mansell to a precocious Ayrton Senna. Geoff Lees is not one that many will remember, but he too had his day in the car with one of the most evocative colour schemes of all time. Lees began his career at the British domestic level in the mid-1970s, where he was a Formula Ford champion. He moved into F3 in a Chevron in 1976, and a year later double-dipped in both the Aurora F1 series and Can-Am racing. Still racing in F3 he was twice a winner at Macao, and meanwhile he had been entered in two World Championship F1 races. In the 1978 British GP, he drove an Ensign N175 for Mario Deliotti Racing, but failed to qualify, and he had one outing for Tyrrell at Hockenheim the next year, where from starting 16th he came ever-so-close to the points by finishing 7th. In 1980 he made several attempts at F1 driving a Shadow, an Ensign, and finally a Williams for the RAM/Theodore team, but these 7 entries proved disastrous, and Lees failed to qualify in 5 of them. In the other two he failed to finish but he was classified 13th in one of them (South Africa). He then went back to European F2 in 1980 in a Ralt/Honda, and with three wins took the title, but no F1 drive was forthcoming. In the event, Lees did get two F1 starts in 1982, but neither came about in happy circumstances. It is well documented just how difficult a season 1982 was, firstly with the seemingly endless FISA/FOCA political battles, followed by the death of Gilles Villeneuve in more than tragic circumstances at Zolder. Although this was by no means as awful, it was still an unfortunate incident when Theodore driver Jan Lammers proceeded to break his finger in a practice accident at Detroit, and for the next race in Canada Lees was called in to replace him. Lees did well to qualify the recalcitrant Theodore TY02 in 25th place, but little did he know that he was about to be involved in the next tragedy to strike 1982. At the Montreal start-line, pole-sitter Didier Pironi stalled, and he was hit by the Osella of Riccardo Paletti, with fatal consequences for the poor Italian. Paletti had started in 23rd spot, and Lees also got caught up in the accident. The resulting damage meant that the Englishman did not take the restart, and for the next race at Zandvoort, Lammers was back in the car. But it just so happened that, on the first lap of the restarted race in Canada, Nigel Mansell in his JPS Lotus clouted the back of Bruno Giacomelli’s misfiring Alfa Romeo. It wasn’t much of an impact, but Mansell (already developing his reputation for being a master of disaster) somehow managed to get his hand caught in the steering wheel, wrenching his arm. As with all subsequent Mansell injuries, this took a long time to heal, and in Holland Lotus test driver Roberto Moreno took his place. Currently known as the ‘super-sub’, Moreno was far from super on his F1 debut, missing out on the grid by almost two seconds. Nothing was going to stop Mansell from then racing at Brands Hatch, but in truth he was still severely hampered by his left arm, and he was forced to sit out the following French GP. Enter Geoff Lees once more, to take his place. Although he too was apparently weakened by a bout of glandular fever, he did better than Moreno and actually managed to qualify, albeit in a lowly 24th, over 6.5s off the pace of pole-sitter Rene Arnoux’s Renault. In a race famous for Arnoux refusing to obey team orders and allow team-mate Alain Prost to take the win, thereby creating the long-standing feud between both drivers, Lees struggled home in 12th spot, two laps down, despite a pit stop for new tyres after being forced off the track and sustaining a puncture as a result. This was not such a bad result, for he finished in front of Marc Surer’s Arrows, both Ligiers of Jacques Laffite and Eddie Cheever, and the Toleman of Derek Warwick, which had flown at Brands Hatch. But after this, Mansell was back and no more was seen of Lees in F1. In fact, Lees went east to Japan to drive mainly Toyotas in the Japanese Sports Prototype Championship, but he recorded his first win in the orient in a Porsche 956 in a 1000km race at Suzuka with Kunimitsu and Kenji Takahashi. After this, he proved to be an extremely consistent performer in Toyotas run by the Dome team, eventually joining the works TOM’S team in 1986. He remained with this team until the end of 1993, recording numerous victories and podium finishes. Returning to Europe, from 1995 to 1997 he was an integral part of the Lister Storm challenge, with Tiff Needell his usual team-mate, but the car was not an attractive proposition. In mid-1997, he switched to drive McLaren F1 GTRs for Gulf Team Davidoff (which in 1998 became Davidoff Classic) with an instant move up the rankings. So much so that at the start of 1998, he won two races within a week at Jarama and Monza with Thomas Bscher. However, Lees’ main highlight (or perhaps lowlight) in 1998 was in the Le Mans 24 hour race, where he was re-united with the Toyota factory team. Sharing his car with Ralf Kelleners and Thierry Boutsen, Lees was leading comfortably with only 80 minutes to go when his gearbox seized. In 2000, Lees has linked up with Bscher again to drive his BMW in the European rounds of the ALMS, with Jean-Marc Gounon joining them for an attempt at Le Mans which once again ended in a gearbox failure for the Englishman.